By Leah Dobrinska. Mar 19, 2016. 9:00 AM. To know Winnie-the-Pooh is to love Winnie-the-Pooh. And thanks in large part to Disney and the commercialization of the beloved classic children’s literature character, almost everyone knows Winnie-the-Pooh. Walk into any store and you’ll see Pooh pajamas, Pooh placemats, Pooh picture frames, and countless other Pooh-inspired paraphernalia. It’s safe to say the image of Pooh is a familiar one. But what about the original A.A. Milne books that contain the stories and poetry that inspire the still-going-strong Pooh parade? They are what dedicated Winnie-the-Pooh collectors are seeking, and they are our focus today. Looking to add to or begin your own Winnie-the-Pooh library? Read on for collecting tips and ideas for the Pooh collector. A.A. Milne began his career writing poetry and essays for literary magazines. Following his service in World War I, he succeeded in penning a number of well-received plays including Mr. Pim Passes By (1919) and The Dover Road (1921). If you are a Milne completest, be sure to look into his magazine contributions, plays (he also adapted Kenneth Grahame’s The Wind in the Willows for the stage in a play titled Toad of Toad Hall), his books for adults, and his sole detective novel, The Red House Mystery (1922). The Red House Mystery was first published in the U.K. by Methuen and in the U.S. by E.P. Dutton & Company. First edition copies sell for a couple hundred dollars. A higher premium is paid for clean copies with dust jackets in fine condition. For those collectors interested in Winnie-the-Pooh in particular, A.A. Milne’s efforts in the mid-1920s likely have your attention. Between 1924 and 1928, Milne published two verse collections—When We Were Very Young (1924) and Now We Are Six (1927)—which include poems about Pooh, and two specific Winnie-the-Pooh books—Winnie-the-Pooh (1926) and The House at Pooh Corner (1928)—for a total of four prime collectibles. See below for more particular details and points on these individual books. We’d also recommend referencing a bibliography, such as B.D. Cutler’s and Villa Stiles’ Modern British Authors, Their First Editions, or John R. Payne’s Four Children’s Books by A.A. Milne, directly. Understand, too, that bundles of the four titles are often available. 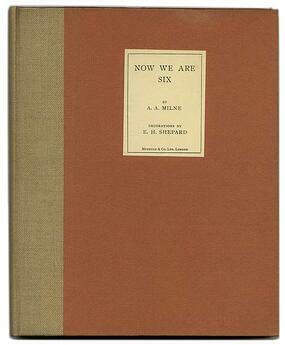 First edition bundles of all four titles in fine or near fine condition with both Milne’s signature as well as illustrator E.H. Shepard’s signature can cost over $25,000. If you are looking at a package, be sure to ascertain whether or not all of the books included are true first editions. Also, check the publisher, as that’ll tip you off to whether or not the books in question are first U.K. editions (published by Methuen) or first U.S. editions (published by Dutton). In When We Were Very Young, Milne places Christopher Robin as narrator and protagonist, and notes in the book's introduction that his son, Christopher Robin Milne, served as his inspiration for writing as he did. When We Were Very Young includes famous poems such as “Buckingham Palace” as well as “Teddy Bear” which was the world’s introduction to the bear who would later be named Winnie-the-Pooh. Shepard’s illustration of Pooh in this case includes his trademark shirt, though without color at this point. First edition copies of When We Were Very Young have blue boards with E.H. Shepard’s decorations stamped in gilt on both boards. Collectors should note that a second printing was completed on the heels of the first printing. First edition/second printing copies of When We Were Very Young include “page ix” listed on that particular page, whereas the first printing of the book does not. First edition/first printing copies of When We Were Very Young are very scarce. Depending on the condition of the book as well as other inclusions, such as the original, illustrated dust jacket, letters, inscriptions, or free-standing illustrations from Shepard, etc., copies can range in cost from $10,000 to over $20,000. A limited print run of what is referred to as the “Large Paper” edition was also completed in 1924. Printed on handmade paper, only 100 copies were published. Each was signed by both Milne and Shepard. These books are incredibly difficult to come by and can cost a collector over $15,000 on their own. 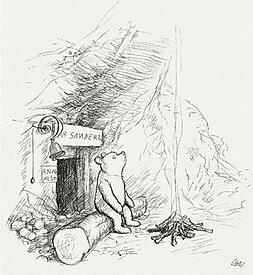 Winnie-the-Pooh is the first book Milne wrote with Christopher Robin, Pooh, and co. as the sole focus. It is a collection of stories, each of which can be read independently of the others. 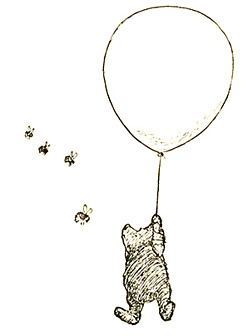 Winnie-the-Pooh includes one of our favorite, authentic Milne quotes: "This writing business. Pencils and what-not. Over-rated, if you ask me. Silly stuff. Nothing in it." 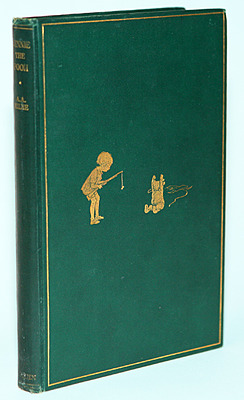 True first edition copies of Winnie-the-Pooh have green cloth binding with E. H. Shepard’s illustrations of Pooh and Christopher Robin stamped in gilt to the front board. First edition copies have a yellow pictorial dust jacket with 117th thousand printed on the back flap and 7/6 net pricing on the spine. The front and rear papers are illustrated with a map of the “100 Aker Wood.” Copies in near fine or fine condition with a similar dust jacket and all the first edition points can cost around $10,000 with good or very good copies priced for a couple thousand dollars. “Large paper” first edition copies were printed on hand made paper and were signed by Milne and Shepard and limited in number to 350. They were also published in London by Methuen in 1926. These copies have two-tone blue boards. Depending on condition, they can cost upwards of $10,000. A similar large paper first U.S. limited edition of 200 numbered copies and 26 lettered copies was also published in 1926, in this case by Dutton & Co. in New York. These copies have blue and pink boards, and in fine condition, they can cost over $10,000 as well. First edition copies of Now We Are Six were published by Methuen and bound in maroon cloth. Both boards have decorations by E.H. Shepard stamped in gilt. Likewise, the pink endpapers feature Shepard’s illustrations. The first edition dust jacket is very pale and includes decorations above and below the title and author text and on the spine. It has been subject to chipping and toning with age. Finding a fine or near fine dust jacket of this edition is difficult, and copies with such a dust jacket can cost $2,000-$3,000. A limited first edition print run was also completed by Methuen in 1927. Again known as the “Large Paper Edition,” the books were printed on handmade paper and signed by both Milne and Shepard. They were bound in salmon paper with a beige buckram spine. There is a printed paper label on the front board, and these copies were limited in number to 200. Signed, limited edition copies in fine or near fine condition with a dust jacket that doesn’t show a terrible amount of fading, rubbing, or wear will cost over $5,000. 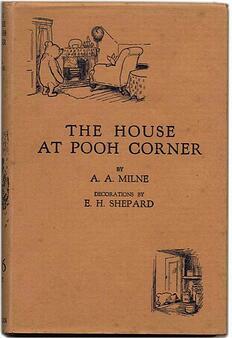 As the last of Pooh written by Milne, The House at Pooh Corner is a prime collectible. True first editions were published in London by Methuen in 1928. They are bound in salmon pink cloth with a gilt stamped border and illustrations of Pooh and Christopher Robin on the front board. In fine editions, the salmon pink cloth will be bright in color. The dust jacket includes Shepard’s decorations on the spine and the front above and below the title and author text. The pink endpapers are likewise illustrated. Watch for chipping to the dust jacket spine. The price of this edition will depend on condition of the book and dust jacket with fine and near fine copies beginning at around $3,000. Like the other books in the quartet, The House at Pooh Corner was also published in a limited first edition print run. These copies have cream paper-covered boards with a blue buckram spine and a printed paper label on the front board. They are signed by Milne and Shepard. In this case, the number published was limited to 350. Large paper copies can cost over $6,000. "Writing the stories was straightforward if I could imagine myself to be Milne, rather than trying to write as he did." Benedictus completed necessary research and invested himself in Milne's world, and thus, that of Winnie-the-Pooh, for years before the 2009 book came to be. Whether or not you believe his efforts to be up to Milne's standards, the book exists, and because it was published more recently, it may be easier (and less expensive) for a collector to get his or her hands on a first edition copy.